What is a Loquat? I have a tree in my backyard. I was introduced to the Loquat tree when I first moved to Florida. There was one between my house and the neighbor’s house. That was my first question: WHAT IS A LOQUAT? When I point out my Loquat tree to folks, they always say, ” I have never heard of a loquat, what is a loquat? A fruit of course! 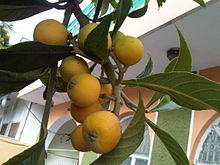 Wikipedia, as well as other research sources, describe the loquat as being a species of flowering plant in the family Rosaceae. It produces fruit. It is native to China, but common in Japan, Korea, India, Pakistan, the Philippines and hill country in Sri Lanka,” not to mention many other temperate climate countries. It is a large evergreen tree grown commercially for its yellow fruit” which is also known as Japanese plum and Chinese plum. Today, Japan is the leading producer of loquats followed by Israel and then Brazil. The wood of the tree is hard and durable. In Central America, they make furniture out of it. In the US, the loquat tree is hardy only in certain areas of the country to include Hawaii, California, Texas, Louisiana, Alabama, Florida, Georgia and South Carolina, flowering only where winter temperatures do not fall below 30 degrees F. In these areas, the tree flowers in autumn and the fruit ripens in late winter. Loquats are unique among fruit trees. The flowers are 1 inch in diameter, white, with five petals which grow on a stiff panicle or small branch of three to ten flowers. They do have an aroma and can be smelled from a distance. The Loquat fruits grow in clusters, are oval, or pear-shaped with a smooth or downy, yellow/orange, or sometimes red-blushed skin. The tangy flesh is white, yellow or orange and sweet to sub acid or acid. The seed/seeds inside of the fruit may be different in number in each fruit – even grown on the same tree; usually one to four in number. They are of a good size for being in such a small fruit. The flavor of the Loquat fruit, which tastes different to everyone, is a mixture of peach, citrus and mild mango. It has a high sugar, acid, and pectin content. It mixes well with other fruits in fresh fruit salads. The fruits can also be used to make jam, jelly and chutney. I clean the fruit, take the seeds out, and freeze them in zip lock freezer bags. They are good as snacks. In Italy, a liqueur is made from the seeds, but with much caution, as the seed contains (like the apricot seed), cyanogenic glycosides (cyanide poison). The leaves contain this same ingredient – even though in Japan they do dry the leaves and use them to make an herbal tea, call Biwa Cha. As for me, I definitely stay away from using the seeds or the leaves for anything but putting them in the garbage. I am too cautious, I suppose. The loquat fruit is said to have good nutritional and health benefits. It is low in saturated fat and sodium, high in vitamin A, dietary fiber, potassium and manganese, as well as Vitamin C, folate, the B vitamins, and minerals to include, calcium, iron, magnesium, manganese and zinc. Regulates blood pressure – according to research, the potassium in the fruit acts as a vasodilator of the cardiovascular system, helps lower the blood pressure and thereby can decrease the risk of heart attacks and stroke. It is also considered a ‘brain booster’ – increasing the flow of blood to the brain. Stimulates the Circulatory System – due to the high iron level which is important to prevent anemia. Iron is essential for red blood cells, part of the hemoglobin, which brings oxygenated red blood cells to all the body’s organs and thereby boosts the circulation. This helps your body to speed up the healing process, increase energy, and keep all the organ systems functioning properly. Lowers Cancer Risk – by the presence of the antioxidants in the fruit. Treats Inflammation – with its own anti-inflammatory properties and analgesic qualities, preventing the body from cellular aging. Can Prevent Diabetes – reducing the blood sugar, regulating insulin levels, and prevents hyperlipidemia in the blood. Soothes the Respiratory System – by clearing phlegm and mucus from the respiratory tract. Improves the Immune System with its high level of Vitamin C, which also encourages the generation of white blood cells is necessary for the production of collagen which supports the growth and repair or organs and tissues in the body after an illness or injury. Improves Digestion – rich in dietary fiber it bulks up the stool and stimulates peristaltic motion which helps regulate the bowel movement. The dietary fiber is essential for constipation reduction, diarrhea, bloating, cramping and other stomach disorders. Helps Control Weight – the fruit is low in calories and it suppresses the appetite. It also improves the metabolism which helps promote healthy weight loss. Eye Vision – is improved because of the Vitamin A, a component important for eye health. This vitamin also helps to prevent the risk of cataracts and macular degeneration. It, as well, is helpful for strengthening and developing bones and teeth. Improves Skin Health – because of the antioxidants essential for preventing early aging, and skin inflammation. It as well, is being researched for use to fight the effects of chemotherapy in cancer patients. Supports the Liver – by eliminating harmful toxins out of the body. Fights Against Viruses – last, but not least, for there are many more benefits to be derived from the Loquat Fruit. Now you know what a Loquat Fruit is, but, as with all foods, despite the wide range of benefits it is necessary to not over consume the Loquat fruits. The precaution is that the fruits can cause toxic myopathy including weakness and non-specific pain. Thereby you should consume the fruit and any derived products from the fruit in moderation. Loquat Fruits are suitable to be added to your daily diet…when in season, or you can buy them or pick them. JUST DON’T OVER-DO!